This block contains the detailed information on how to work with JetMenu presets and apply different style presets to different menu locations. 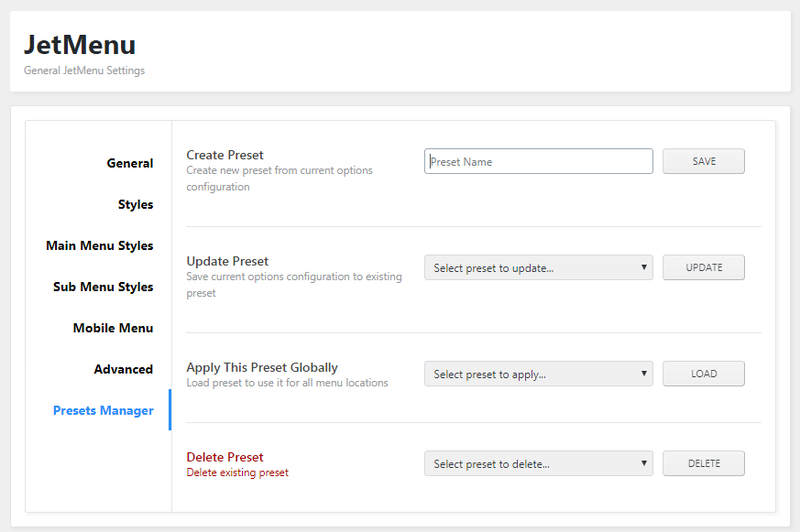 Preset is the number of previously set menu style settings which are saved and can be updated or applied to one of the menu locations on the site. In order to create a new preset, first, navigate to WordPress Dashboard and open JetMenu. Here you can change the menu style according to your needs. After that open Presets Manager tab and type in the preferable preset name in the Create Preset field. Then click Save button. You’ll see New preset was created. Page will be reloaded notice under the Create Preset option. You can return to the saved preset anytime you need to make changes in it. To do it select the needed preset to which you want to apply changes in Update Preset dropdown list, and click Update button. Then you’ll be able to make changes in the preset you’ve chosen. 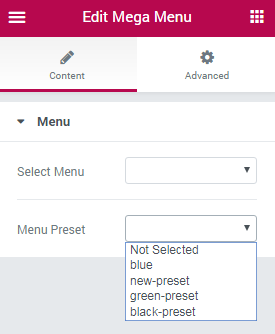 To use the selected preset for all of the menu locations on your site, please, select the needed preset from the Apply This Preset Globally list, and then click Load button. The selected preset will be set for all of the menu locations on your site. If you don’t need one of the presets anymore, then select it in the Delete Preset list and click Delete button. In order to apply one of the presets to the specific menu location, please, navigate to Appearance > Menus. Here scroll the page down to select the locations for the menu. Check the locations for the menu to which you want to apply different presets depending on its location. After that locate JetMenu Settings block. Here you can enable JetMenu style settings for different locations. Just below the Enable JetMenu option you can see Select menu preset dropdown list. Here you can select the style preset for the specific menu location. 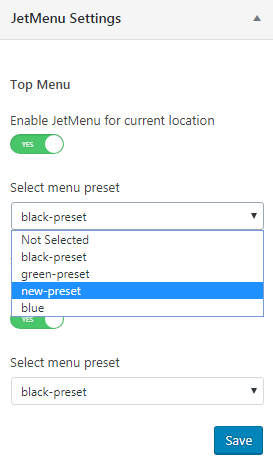 In the case you’re working with JetMenu Mega Menu module, you can select different menu presets for each of the menus. To do it, please, add the Mega Menu module to the page created with Elementor. In Content block you can select the menu style preset in the Menu Preset dropdown list.